Las Vegas Mobility Scooter Rentals - Jazzy Select Elite | Up to 300 Lbs. * The prices that you see is what will be charged to your credit card, taxes, delivery and pick-up are included; Per each additional day of rental add $13.00. LAS VEGAS SCOOTERS protection plan it's optional. 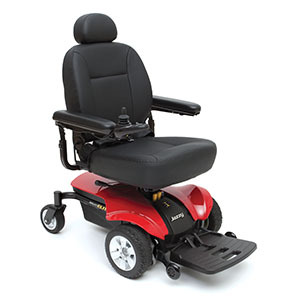 Please read the description, advantages, recommendations and tips before renting your power chair. This scooter is the 2017 jazzy select a full size power chair portable with a capacity of 300 lb ,this power is really nice as you can see, if you are between 100lb to 300lb and you are looking for something with style ,luxury and easy to transport and easy to maneuver this is the perfect power chair. Maybe you just want to cruise Las Vegas strip with style. The 2017 jazzy select is what a power chair of the 21st century should be. You will be able to get around in tiny spaces in casinos, hotels, malls, buffets, etc, thanks to its easy maneuverability. Jazzy power chairs are top-rated in reliability and performance and durability. We guarantee the availability of the product when reservations are made in advance, color red available. Description: This power chair is portable up to 300 lb, luxury kind as you can see, this is the power chair for the 21st century, the battery range is from 10 to 15 miles, the max. Speed is 4.0 mph. Advantages: Can hold up a 300 pound person and it is really easy to transport, the heaviest piece weighs 99 pounds (base).